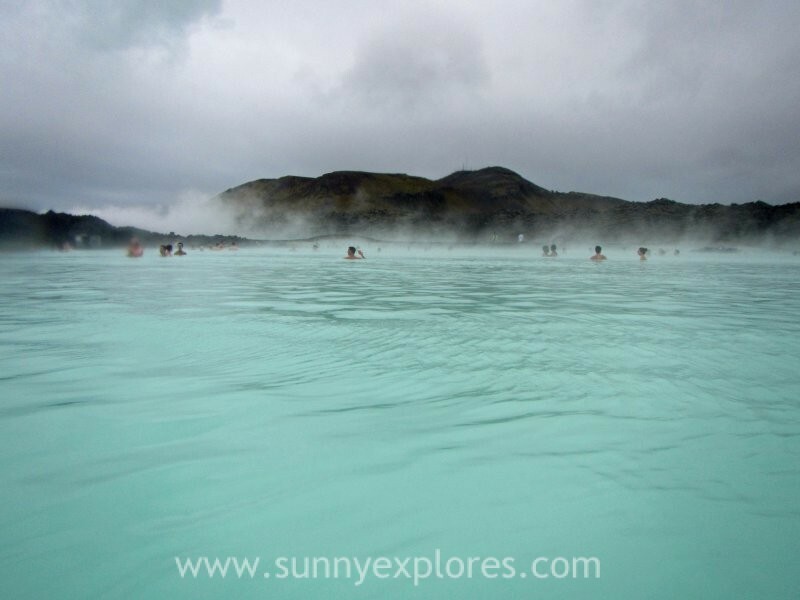 Reykjanes peninsula is most famous for the Blue Lagoon, Icelands most popular tourist attraction. Most people only hurry by this area on their way tot he airport. But that’s a shame, Reykjanes has so much more to offer then the airport and the Blue Lagoon. 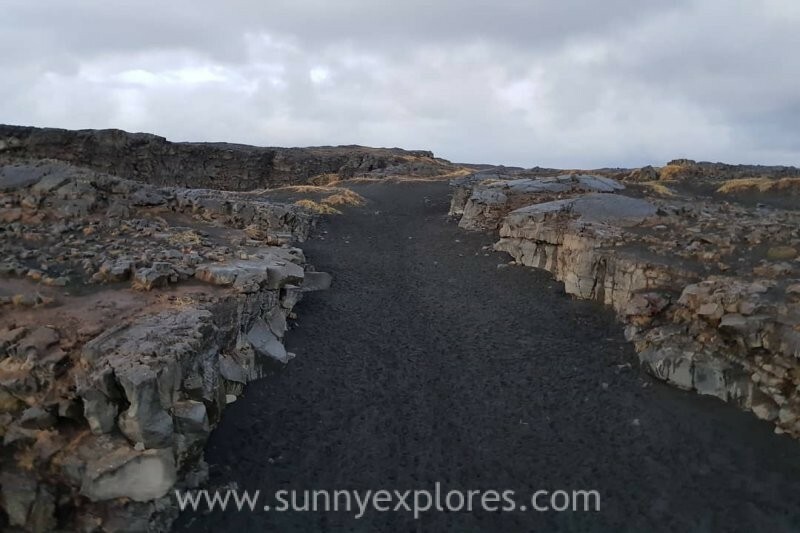 I explored this part of Iceland in the pouring rain and the gray sky and the vast lava fields changed the world into a fascinating black and white movie. Here are 5 places you have to visit in the Reykjanes peninsula. 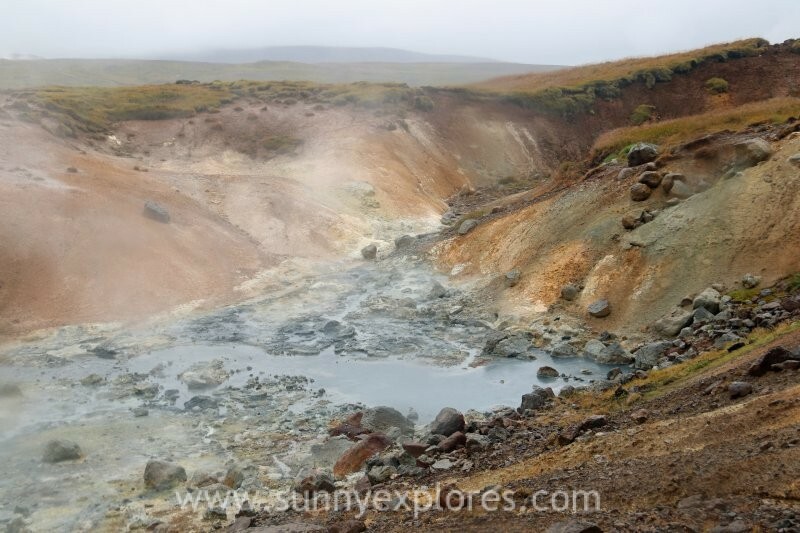 Seltún is how I imagen a lunar landscape to look like; with red, Mars-like gravel and steaming vents. 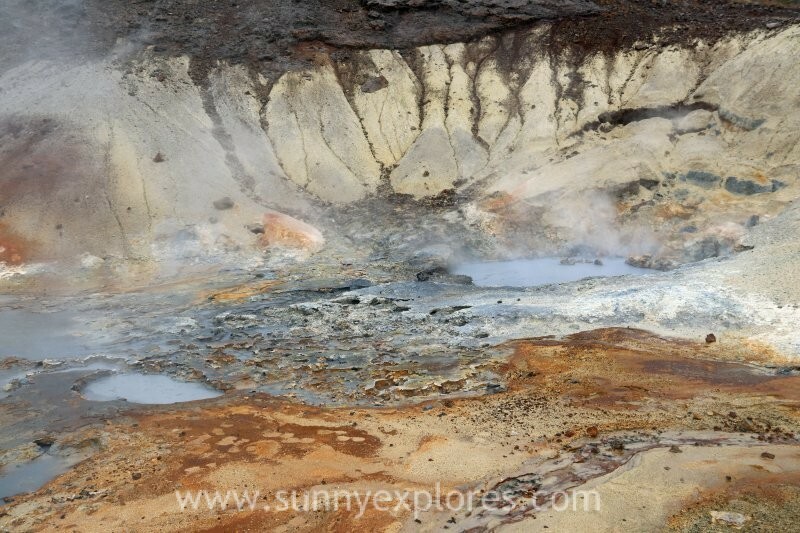 Seltun is dotted with bubbling pools of mud, fumaroles and hot springs. It’s amazing to view this activity from one of the many wooden walkways around the springs. The hots pools range in colour from red, orange and green, creating a dazzling kaleidoscopic effect on the ground and surrounding hills. The reason for this geothermal activity is because of Krýsuvík’s location in the middle of the fissure zone on the Mid-Atlantic Ridge. The lava-scarred Reykjanes peninsula lies on one of the world’s major plate boundaries, the Mid Atlantic Ridge. According to the continental drift theory the Eurasian and North American tectonic plates are continuously drifting apart with great forces under the gaping rifts. As the plates diverge, linear fractures, known as fissures form due to stresses created by the tension that builds up as the plates move away from each other. The Bridge between two continents at Sandvík is a small footbridge over a major fissure. The bridge was built as a symbol for the connection between Europe and North America. The Blue Lagoon hardly needs an introduction. The Blue Lagoon started as a pool of wastewater from the Svartsengi geothermal plant in 1976. The first person to bathe there was Valur Margeirsson in 1981. People called him grazy for bathing in a ‘blue mud pool’. He and others soon began to notice the remarkable healing qualities of the azure waters. Those with conditions such as psoriasis found the waters immediately soothing. News quickly spread, and by 1987, the first swimming facilities were officially opened. Now there are an open pool, a luxurious spa, research centre and hotel. 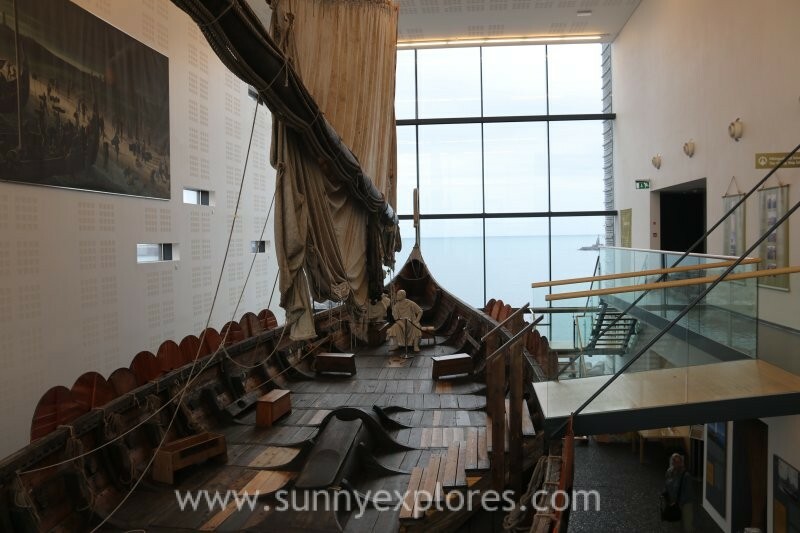 This museum is built around the Viking Ship Íslendingur (the Icelander). Built in 1996, the Icelander is an exact replica of the famous Gokstad ship, an archaeological find of an almost completely intact Viking ship, excavated in Norway in 1882. Íslendingur was built by Gunnar Marel Eggertsson who sailed it to New York in 2000 to commemorate Leifur Eiríkson’s journey over the North Atlantic to the New World a thousand years earlier. The museum itself is a spectacular modern building situated right by the Faxafloi bay in the town of Reykjanes, and can be easily spotted from the main road between the international airport and Reykjavík. Reykjanesviti lighthouse is Iceland’s oldes lighthouse. It stands on a hill and looms over a beautiful beach, marked with tall, straight cliffs. The coast is wild and stunning. A must stop during your Iceland trip. So don’t overlook the Reykjanes peninsula as most travelers do: it’s an interesting area to explore.